Before the Civil Liberties Committee vote: will reason win? Will LIBE kill the filter? After a few postponements, the vote at the LIBE Committee on their opinion on content filtering article is finally happening today. Given the variety of amendments tabled by its members, it is understandable that the MEPs took their time in negotiating common ground. Unfortunately the deletion of article 13 was not an option for the Civil Liberties Committee. So what would be the next best outcome of the vote? LIBE was the last Committee to be granted a right to release an opinion on the current copyright dossier. Following the Committee mandate, it will only opine on article 13 and corresponding recitals as the ones having implications on fundamental rights and privacy of users. In his decent draft opinion, rapporteur Michal Boni stepped away from the content filtering obligations and tried to clean up the mess the European Commission had left MEPs to deal with regarding intermediary liability. That probably didn’t help him make more friends within the European People’s Party, his own group that in part supports the filtering obligation. However, in a surprising twist of events, Boni’s draft was adopted as part of the final opinion of the Internal Market and Consumer Protection Committee, instead of the compromise language proposed by rapporteur Catherine Stihler and some truly horrific alternative ideas on how to make filtering great again authored by some Committee members. Does creative industry support creativity? This post is based on the talk Anna gave during CopyCamp 2017 “Paradigm Lost? How Our Freedoms are Weaponized Against Us and What We Can Do About It”. A video of the talk is available here. How do you lobby for a great copyright in the post-political world? With difficulty, since it is also a post-factual world: politicians seem to care more about marketing than evidence. Perhaps when the facts are not important we should then look for a better propaganda? This “better propaganda” should not be populist or based on lies. Digital rights organizations need a better, compelling narrative to convince people to care more. We need to test new approaches because European citizens do not realize that they are bound by the copyright framework every time they access news, knowledge or entertainment on the internet. We also need to find more compelling ways to talk about rights in the digital environment because these days everybody is a creator and the only difference is that some of us identify as such and many of us don’t. Those of us who don’t, also don’t think that our small acts of creativity such as memes or photos we post online are serious enough to give us this status, but this does not change the fact that we are indeed creators. In both cases creativity is crucial for self-expression, and self-expression is key to one’s identity. Today all three: creativity, self-expression and identity become market commodities, increasingly so via social media. So what happens when they enter the market? For those watching the copyright debate in the European Parliament it is no mystery that European People’s Party is the key power to influence the future of the Digital Single Market in this area. The largest Parliamentary group, whose representatives hold crucial positions on the dossier, has adopted a group line on copyright. While both the LIBE and JURI Committees debate their compromise under EPP rapporteurs, what could possibly go wrong? The Parliamentarians affiliated with EPP have not presented a unified line in the reform debate, especially if it comes to content filtering (article 13 of the proposal). Their positions across various committees have ranged from hardliners such as Angelika Niebler’s, supporters of closing the value gap like Axel Voss, the current rapporteur at JURI, through the balanced position of Therese Comodini, Voss’ predecessor; to rapporteur Michał Boni’s decent draft report at LIBE or Róża Thun’s proposal for deletion tabled at IMCO. In these circumstances EPP’s attempt to create a common ground is understandable – it is a way to preserve group unity. On the other hand, the exercise can only prove effective if it shaves off the extremist positions: of making the EC proposal even more troublesome for platforms and users as well as of deleting the article. Positions of the political groups in JURI with respect to selected elements of the DSM directive proposal [Source]. The EPP group line adopted in July 2017 tries to reconcile a need to close the perceived value gap with some arguments protecting fundamental rights. The vision for EPP’s ideal article 13 is to ensure platforms enter into licensing agreements with rightholders to secure a better revenue for the latter. Harming e-commerce, taking it easy on the filtering? What will be the “Future Made in the EU” after the copyright reform? Science fiction usually mirrors contemporary challenges and anxieties better than the future it tries to predict. Nevertheless, that does not stop creators from imagining that future. Rightfully so, even if as nowadays the technology advances so fast that some concepts age before they have a chance to be applied. Centrum Cyfrowe, a Polish COMMUNIA member, does not usually deal with science fiction, but the ongoing yearlong debate on the copyright reform has unexpectedly directed them towards speculative design in modeling the future. 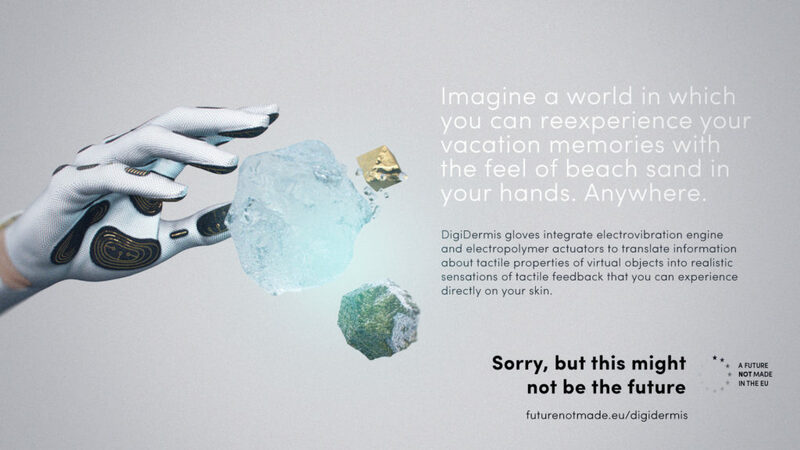 A Future not Made in the EU campaign presents future objects and services that may enhance cultural and educational experience, but their future is uncertain – their utility does depend on whether the copyright reform addresses future challenges properly. Meanwhile, the law is usually drafted based on the past experiences rather than on recognising future challenges. The longer we are in this debate, the better we can see that looking backwards to regulate participation in increasingly digital culture may result in fatal consequences. If the authors and contributors to the copyright reform look behind their shoulder while drafting it, we will end up stuck in the analogue era. Specifically, Europe will end up like this. The rest of the world will advance forward. We were hoping that the Committee on Civil Liberties, Justice and Home Affairs (LIBE) rapporteur Michal Boni would make use of the Committee mandate to suggest deletion of entire article 13 from the proposed Directive on Copyright in Digital Single Market. That didn’t happen. The justification of the report reflects a hope that the idea to regulate agreements between platforms and rightholders can be sustained while respecting fundamental rights of users. But do the LIBE amendments meet that goal? The very good news is that Rapporteur Boni proposes to remove content recognition and all references to the use of technology as a default option from the directive. MEP Boni also explicitly says in his report that the implementation of the agreements should not impose any general monitoring obligations. The concept of content filtering has been making quite a career. Not only did it land in the copyright directive proposal, but also it has been introduced into the draft of the Audiovisual Media Service Directive (AVMSD) that is currently making its way through the European Parliament. In the context of the AVMSD, filtering of uploads by video-sharing platforms would serve to prevent legal audiovisual content that could harm children. As important as protecting children may be, the CULT Committee has just voted against that idea. This was the right thing to do. A seemingly quick solution to filter whatever the decision makers don’t want users to see is a very dangerous tool in any context. It is an arbitrary approach to the flow if information online and as such it can be used as a censorship machine. This “automatized conscience” will operate on a very abstract definitions of content that could impair children’s “physical, mental or moral development” or incitement to terrorism, violence and hatred. Humans often argue about what constitutes such incitement with many cases finding their finale in court. How could we trust algorithms with such a dispute? Fortunately, 17 members of the CULT Committee understood that. Nine of them either do not see the danger or have an unwavering faith in the potency of technology to solve complex societal problems. Hopefully, the AVMSD debate helped CULT Committee see both the danger and the pointlessness of content filtering and they will take a similar decision for a better copyright. After all, in the context of copyright, putting the interest of rightholders before the interest of the public is an even worse reason to employ algorithms as censors. Will the old thinking win? Now that most of the committees have published their draft opinions on the Commission’s Directive on Copyright in the Digital Single Market, it’s time to hear their members presenting their initial views. JURI hosted a meeting on 22 March where MEPs voiced a range of opinions on various aspects of the copyright reform proposal. The divide between the MEPs seems to run deeper than mere disagreements on definitions; instead, they underscore a fundamental schism in the MEPs’ understanding of the world we live in. Some MEPs reacted to the copyright reform proposal using a 20th century ordering of the world, where mass-scale creative industries emerged and eventually were consolidated. For MEPS such as Jean-Marie Cavada (ALDE, France) or Angelika Niebler (EPP, Germany) the world has not changed all that much in terms of where important stuff happens. Cavada and Niebler think publishers and other rightsholders produce all the real value, while the internet and new sharing technologies is like a portable TV that that main purpose of is to constantly rip them off. Seeing the world like that, it’s no wonder that they mostly approve of the European Commission’s original proposal, and oppose reforms that champion users’ rights, which for the most part they see as legitimizing tech-enabled theft. There is no coincidence that many of those creative industry backers are from France and Germany, countries that built their considerable entertainment industries well before the digital era. Again we are witnessing an attempt to make the Frankenstein’s monster, article 13, a bit prettier as the Legal Affairs Committee’s (JURI) report has been officially published. Instead of killing it altogether with its recitals, MEP Therese Comodini Cachia tries to save the numbering of the proposal and at the same time to diffuse the bomb the European Commission set against users’ rights. The reading of the proposed article 13 text leaves no doubt that the intent is to remove the upload filter. The reference to “preventing the availability” of content uploaded by users who have no ownership over it is gone from article 13 paragraph 1. The emphasis is on effective and proportionate measures that the information society service providers need to take to ensure that the agreements they conclude with rightsholders are functioning well. At first sight the amendments proposed for article 13 seem good. What kind of measures should be carried out is left open. It can be really anything that parties decide would work for them, be it some compensation or a share in the revenues the content users upload generates when there are ads on display. Unfortunately, looking into the recitals, it gets more complicated. Ms Comodini proposes no rewrite to recital 39 that would change the fact that the content recognition remains a go-to technology in terms of assessing the rights to uploaded content. What are the consequences of that? It means that effectively the ISSPs and rightsholders are not encouraged to look beyond tech solutions to address any perceived disparities of income. Rather, the directive legally validates the existing market practice of employing tech such as Content ID to sort out ownership of the content. With her concept Ms Comodini may have closed the gate to filtering uploads but she left the path leading to it basically intact. Another consequence is that if article 13 had ever meant to make Youtube weaker, by constant relying on tech solutions in settling human disputes, it equips the tech giant with an enormous competitive advantage. After all they already have Content ID. It is great that ITRE Rapporteur Zdzisław Krasnodębski joined IMCO Rapporteur Catherine Stihler in thinking that the right to read is the right to mine. As we explained in detail, his draft proposal opens up the TDM exception to anyone and makes sure any safeguarding measures won’t stand in the way of applying the technology. As progressive as it is, however, the fact that ITRE’s Rapporteur focused only on TDM and proposed a minor tweak of article 14 is also a statement. What is not mentioned is as significant as the changes that are proposed. The fact that the most controversial articles are not a subject to any improvement by the ITRE draft opinion may of course indicate how the Rapporteur perceives the Commission’s mandate to propose input on copyright. Naturally, the TDM exception would provide an enormous opportunity for the European industry to expand their R&D without looking for an academic partner to benefit from the exception. But is that really all there is in the directive proposal that could benefit the realms of Industry, Research and Energy? In the information economy, modern accessible education is a cornerstone. Now that across all industries there is an enormous demand for workers that can keep up with developments in technology and knowledge, lifelong learning becomes an inseparable element of any professional career.